On to the game, as I thought the Tigers might come out swinging as they did in the ninth inning the night before. They were actually off to a two-run lead after a first inning home run by Jeimer Candelario and a fourth inning dinger by Niko Goodrum. Last seasons Rookie of the Year Michael Fulmer was keeping the Reds at bay, until the wheels came off in the sixth inning in the form of three runs. 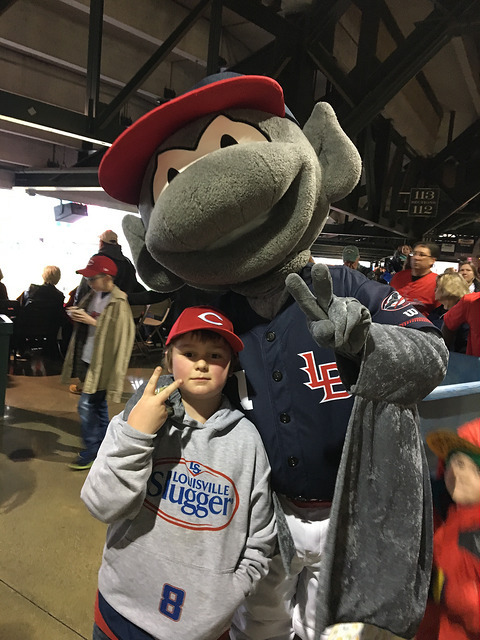 Scooter Gennett, Eugenio Suarez, and Adam Duvall all homered for the Reds, to give Cincinnati five runs in the last three innings. 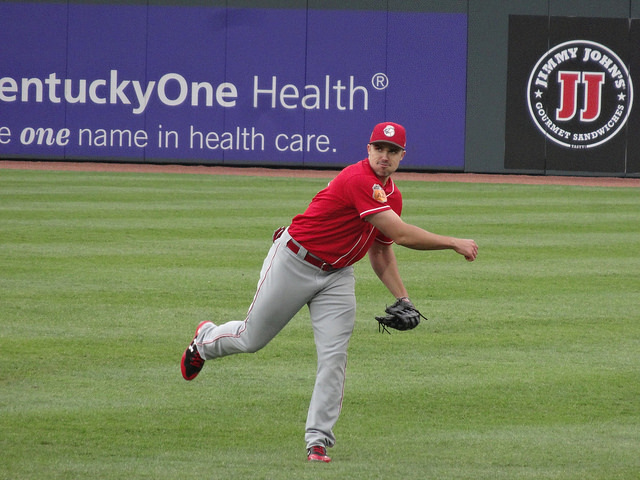 Tyler Mahle would start and earn the win for the Reds, as Fulmer took the loos for the Tigs. Final: Reds 5, Tigers 3. Always fun to be at the ballpark, but the heat and the Tigers getting creamed two days in a row was a bummer. The Reds were just recently in Detroit and were swept in three games, so that was a little payback for the Tigers. 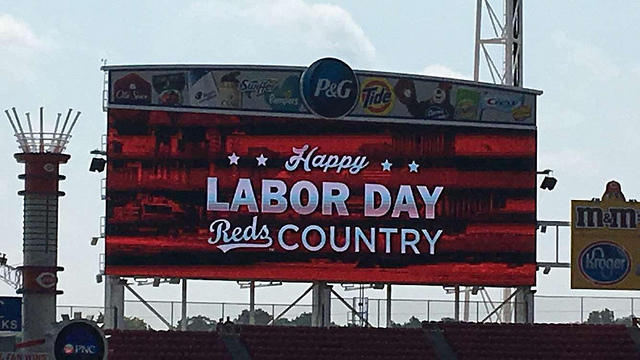 Great American Ballpark-Cincinnati, OH: Oh, Labor Day. 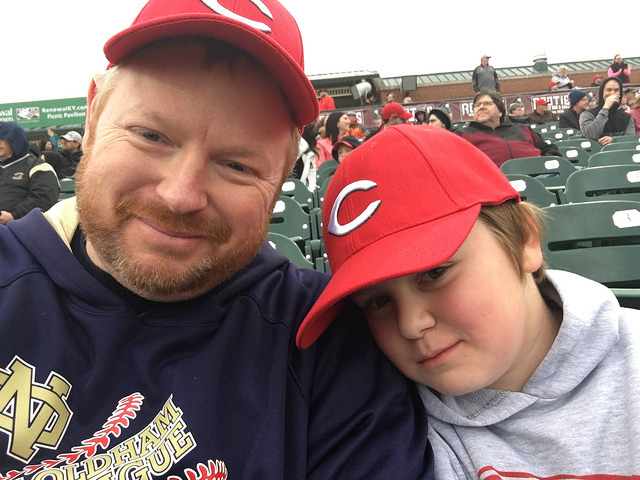 When most people are smart enough to take a day off and relax, we decided to head up to the Queen City for some Reds baseball. As usual, we parked in Newport and took the boat over to the ballpark. Since the boat always drops us off at the back of the park (duh, like, it can’t travel down the street and around the corner…), Trevor and I decided to walk around and check out the façade. 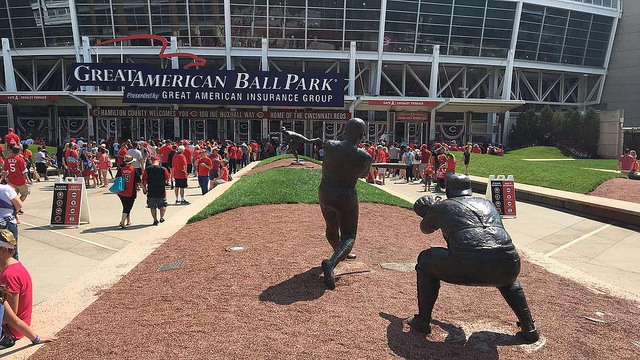 I took a photo of some of the statues featured out front, such as the greatest catcher ever Johnny Bench and ‘Charlie Hustle’ himself, Pete Rose. 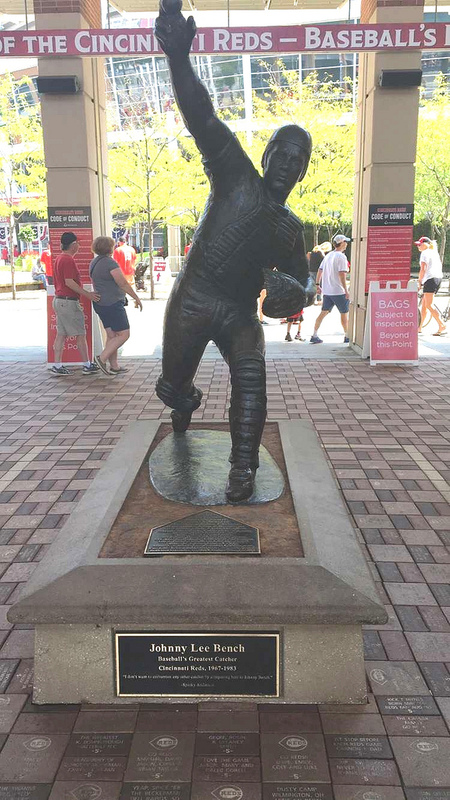 The Rose statue is new to the ballpark this season. I thought we had great seats again, in the bleachers, but the front row which gave us a great view of the field. 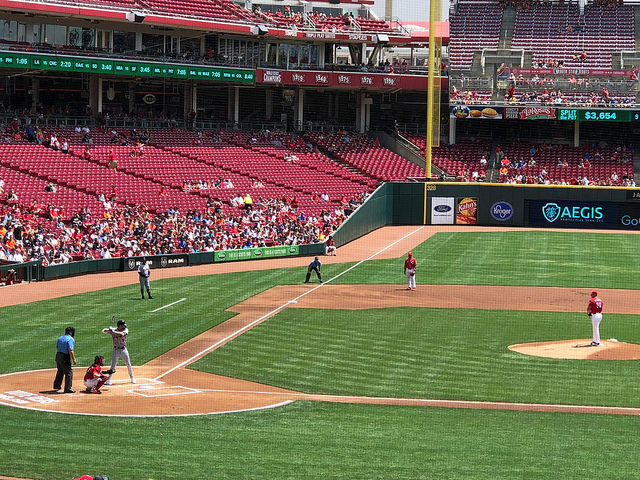 The game started a little slow, and the Reds finally took a 1-0 when Joey Votto took a walk in the third inning to drive in a run. Not very exciting, I know, but a run is a run. Trevor wasn’t happy in the hot sun, so we found some seats with some shade, and a little closer to the action. 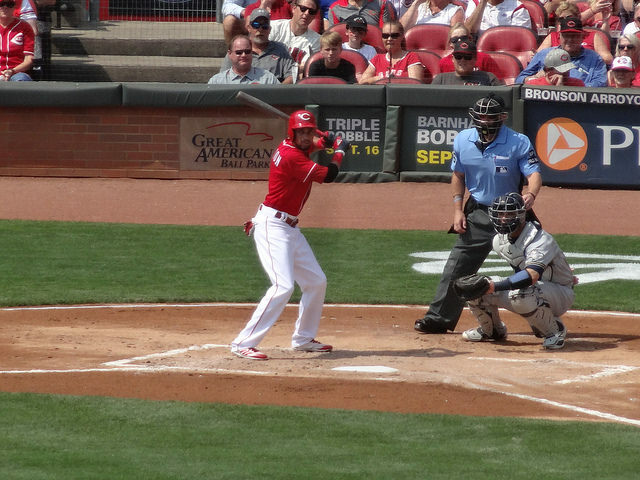 The Reds scored another run in the 6th, when Eugenio Suarez earned a walk. Yeah, I know. Yawn. But then Tucker Barnhart hit a double that plated two, so business was picking up. 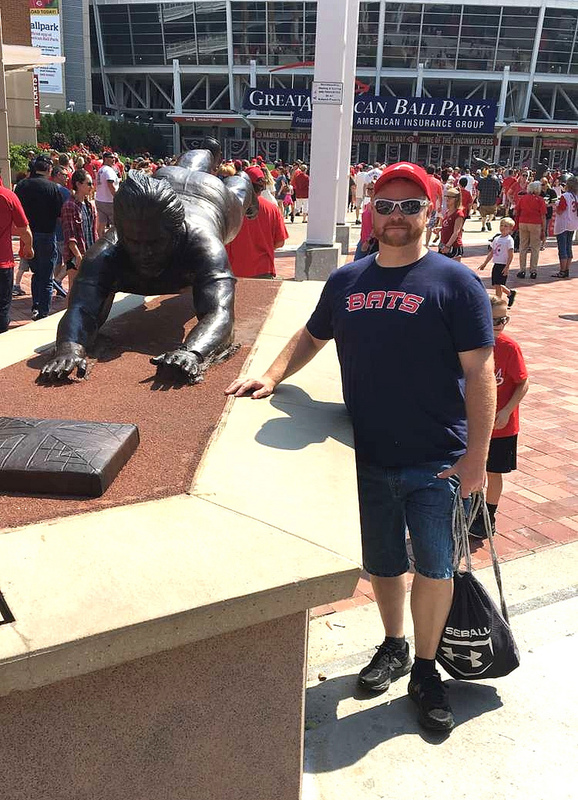 The Reds were up 4-0, and I was feeling pretty good about the game. 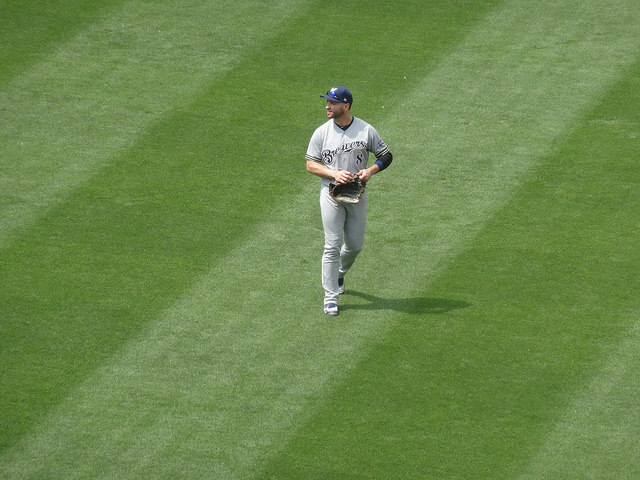 The Brewers came storming back top of the seventh, however. 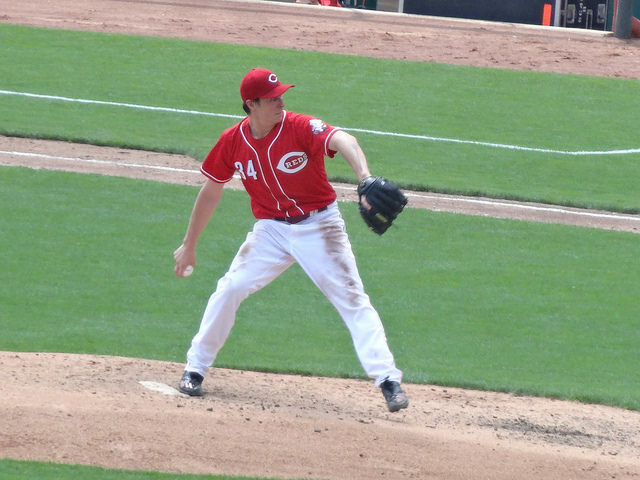 Homer Bailey got the start for the Reds, and he pitched a solid six innings, giving up three runs and striking out four. A pair of home runs tied the game at four going into the late innings. Still tied at four bottom nine, it was hero time for Billy Hamilton. He hit his first right-handed home run of the season to set off the fireworks and give the Reds the win! 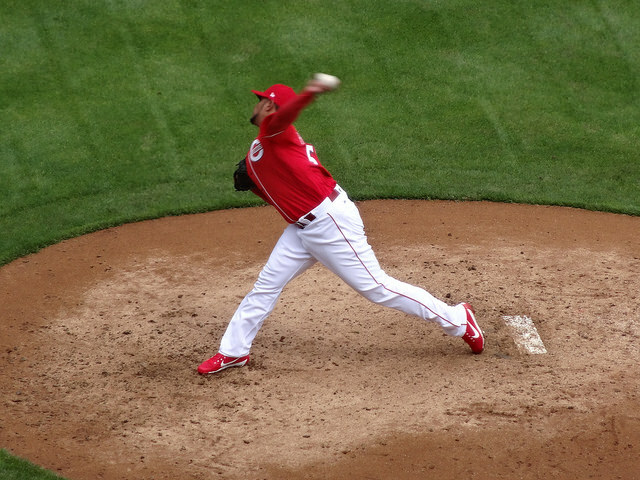 Relief pitcher Raisel Iglesias got the win for Cincy. This was a great way to spend Labor Day, even though I only got a half-hour nap in before working all night. 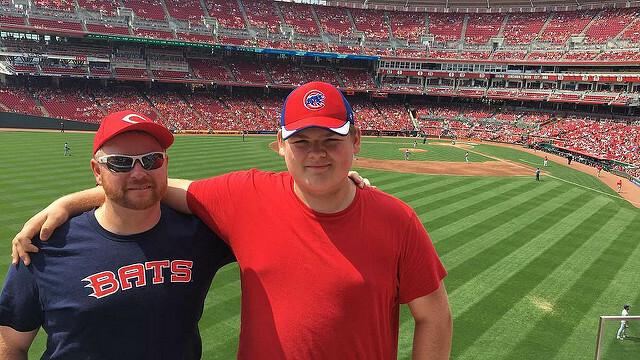 It was worth it for a fun day of baseball with Trevor. FINAL: Reds 5, Brewers 4. 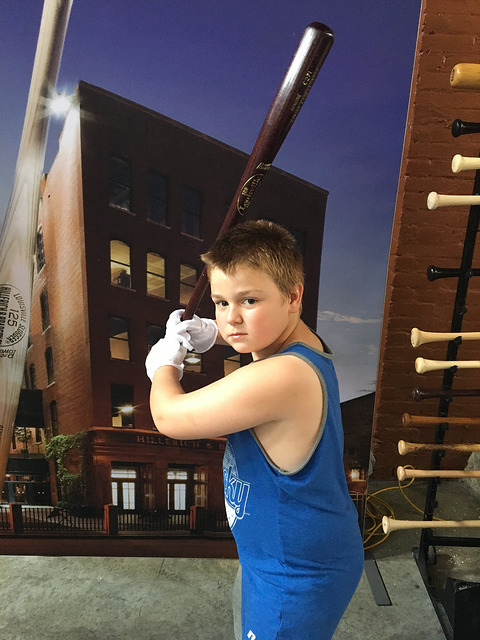 Louisville Slugger Field-Louisville, KY: I’m not going to lie. We never saw one inning of this game. 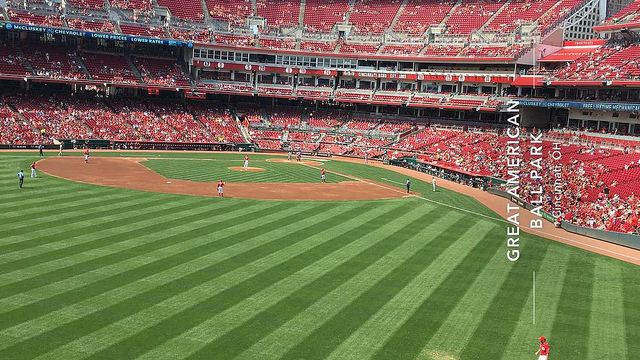 Not one pitch, not one at-bat…nothing. For some reason the ACC decided to keep postponing the game, even though the weather was fine at the time. 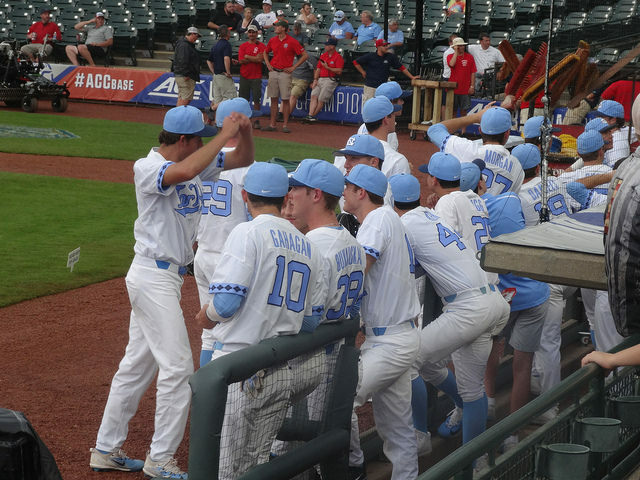 The photo above is the TarHeels just hanging out, waiting to play ball. However that wouldn’t happen for a couple of more hours. Yes, there was a chance of rain, and yes, it did end up raining, but not until after the postponed start. The ACC could have given the go-ahead, and when it DID rain, at least the teams would have gotten a large chunk of the game in. 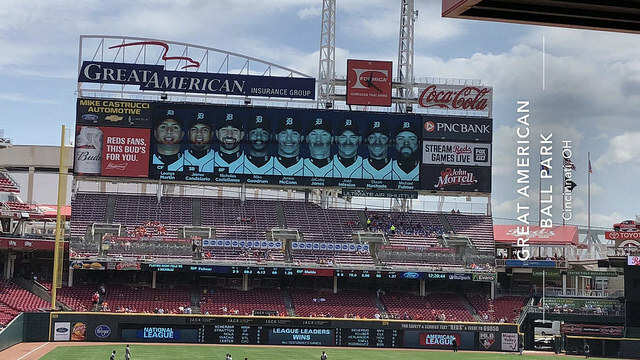 Also, as we did, a large chunk of the paid attendance wouldn’t have been cheated out of a game, either, as fans headed for the gates when the announcement came that the game wouldn’t start for awhile, yet. FINAL: TarHeels 12, Hurricanes 4. I’m not going to lie. I really would have liked to have seen this game, but since it didn’t get over until almost midnight, that would have made for a very long and strenuous day, especially with my dad and Brian at the ballpark impatiently waiting for baseball that we paid for. 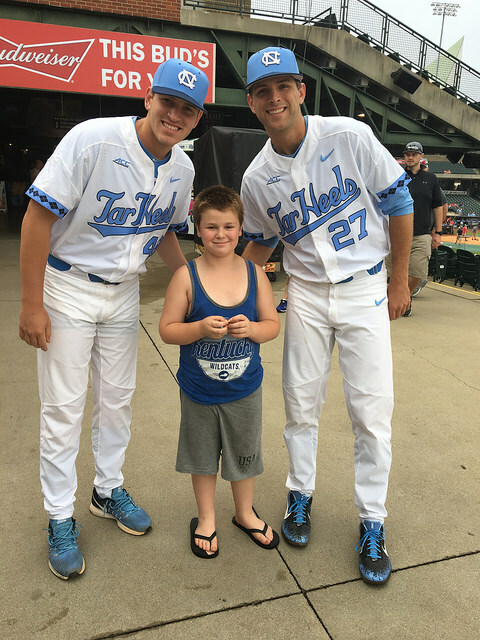 At least Brian got to meet some of the North Carolina players, but we didn’t have a chance to catch up with any Hurricanes. 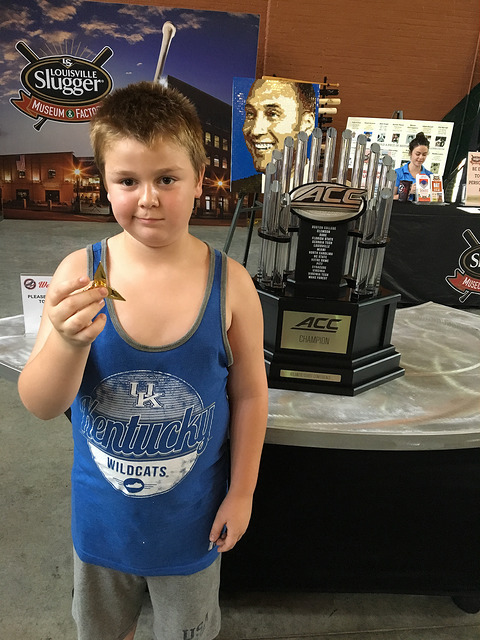 Before the announcement of the delay, we took the time to check out the ACC Fan Fest in the West Wing of Slugger Field. I really wish the ACC would have shown that this is an important event, and maybe had some more things going on, and maybe some of the school mascots on hand instead of just cardboard cutouts of them. Brian at least got to see the ACC Championship trophy, too. 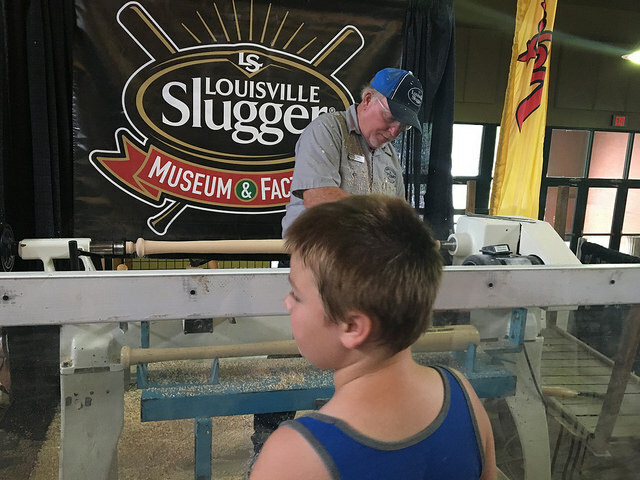 We spent most of the time at the Louisville Slugger display, where Brian was able to hold some bats of Major Leaguers, including Louisville’s own Adam Duvall. Again, we were all very disappointed that we weren’t able to see any of this game, but just couldn’t stay there and wait around any longer. 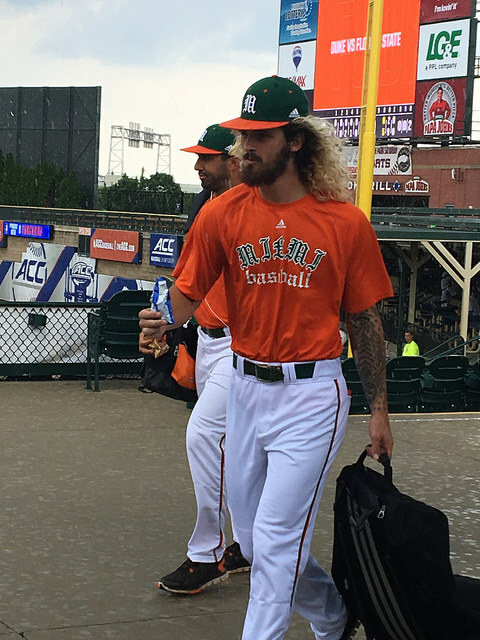 I honestly wasn’t that impressed with the way the ACC handled this tournament as a whole, from the pool play down to it’s weather delays. But, then again, having NC play until midnight and have to be ready to play the next day at noon, gave a HUGE advantage to the waiting Seminoles… Hhhhmm…. 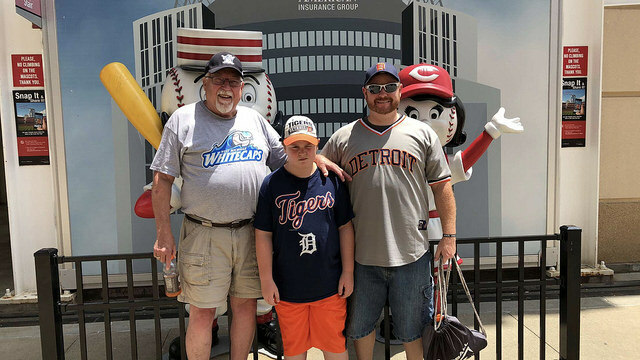 Great American Ballpark-Cincinnati, OH: We’re used to taking my dad to a ballgame for his birthday up in Michigan, but since we’re down here now, we decided to invite him down here for a game (or two, or three). 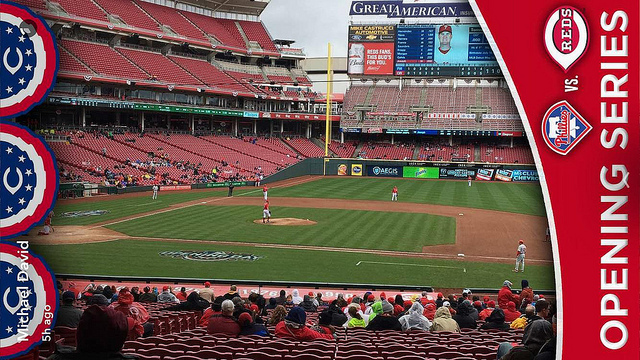 We’re also used to some crummy weather up there, so a little cold and rain certainly didn’t keep us from the ballpark down here. 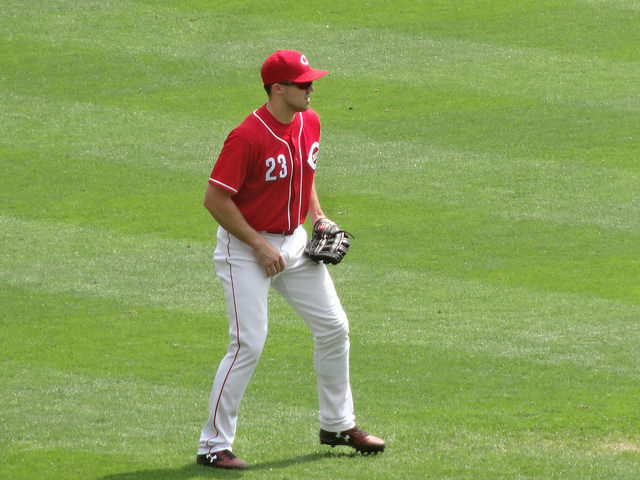 This was his first game in Cincy, also, so it was a special day. Lucky for us the usher we met was also a Tiger fan, so he took good care of us. 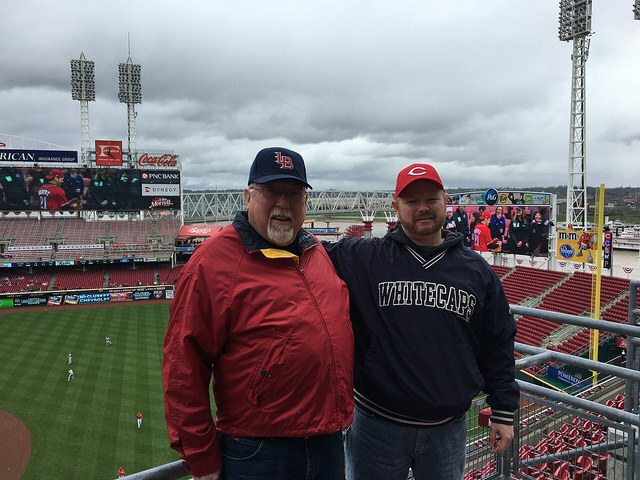 He was nice enough to take a photo of us together, as well as get my dad a certificate for his birthday and first Reds game. There wasn’t much of a crowd, but we enjoyed our seats in the front row of the upper level. There was a little rain, but we donned our ponchos and kept dry. There wasn’t much of a crowd, so we could pretty much sit where we wanted. After a few innings on the upper level, we moved below to enjoy the rest of the game from there. 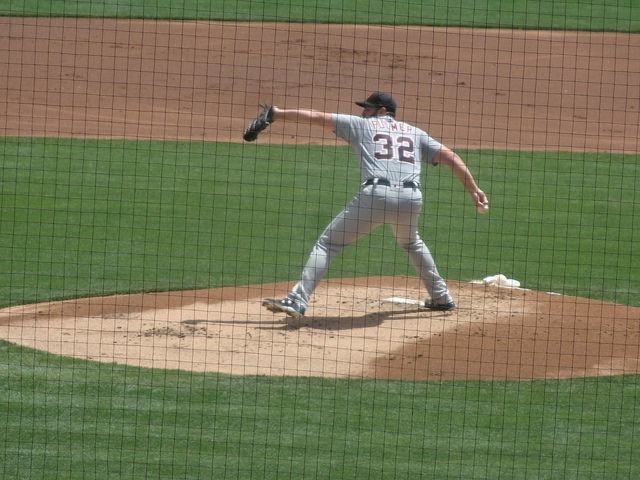 On the mound, Rookie Davis was getting his first Major League start, as he is, well, a rookie. He didn’t pitch horrible, but did give up a couple of home runs, allowing four runs in five innings of work, while striking out four batters. Despite being down a few runs, the Reds bullpen was strong. 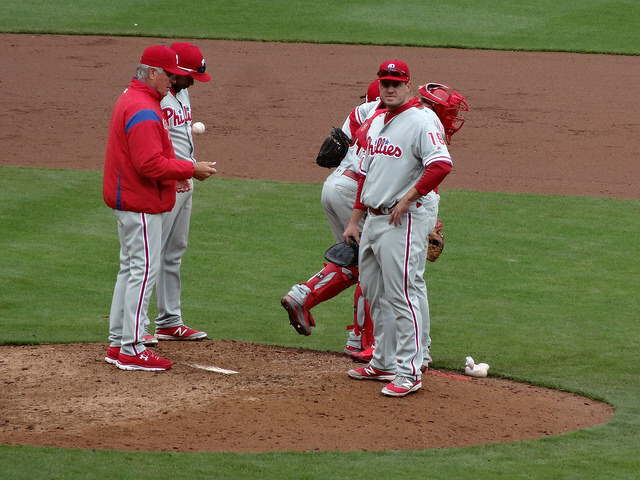 Cody Reed ended up getting the win, throwing two scoreless innings. Drew Storen earned the save by pitching a scoreless ninth and striking out two. 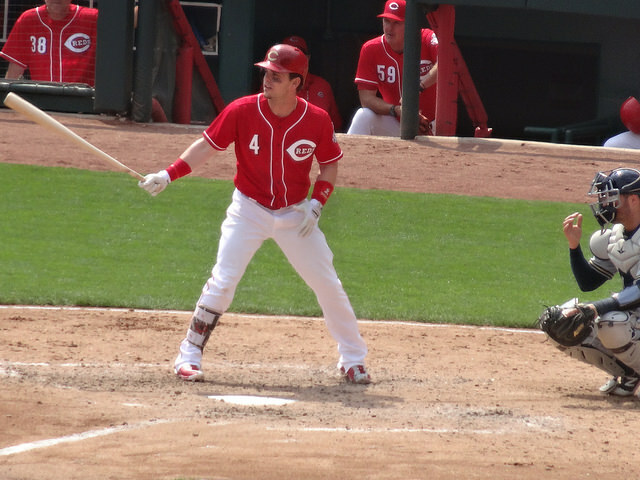 Cincinnati was lead offensively by Adam Duvall, who went 2-4 with a home run and two RBI’s. 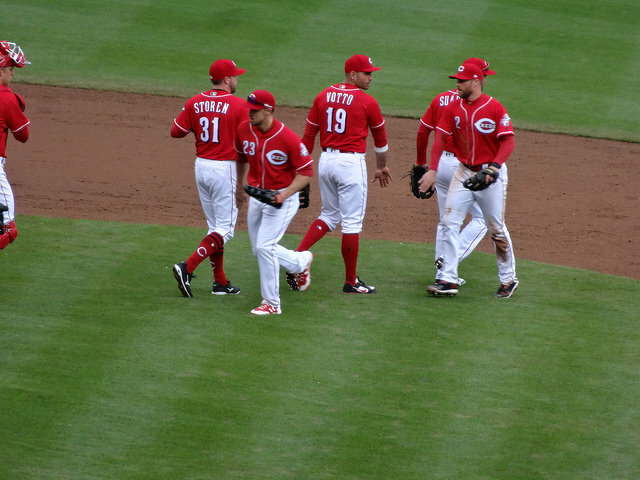 Also pitching in were Zach Cozart, going 2-3 with two RBI’s; Eugenio Suarez, going 2-3 with two runs scored; and Billy Hamilton, going 2-5. 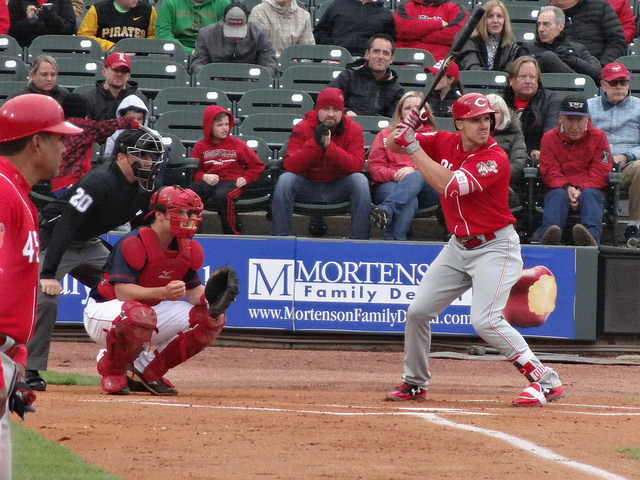 Pitcher Michael Lorenzen also stepped up to the plate and hit a pinch-hit home run! 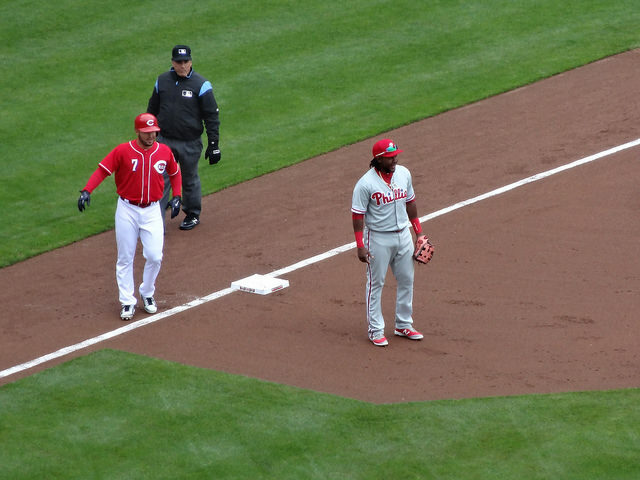 It was a solid day all around offensively for the Reds. Final: Reds 7, Phillies 2. 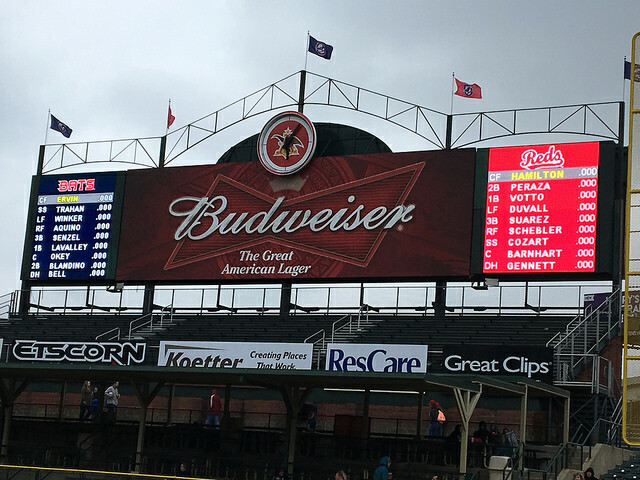 Despite the weather that seemed to keep most fans away (and the fact that it was a weekday day game), this was a fun game to watch. I’m not sure when we’ll make it back to Cincy again, lots of minor league and college ball the next couple of months to keep us busy! 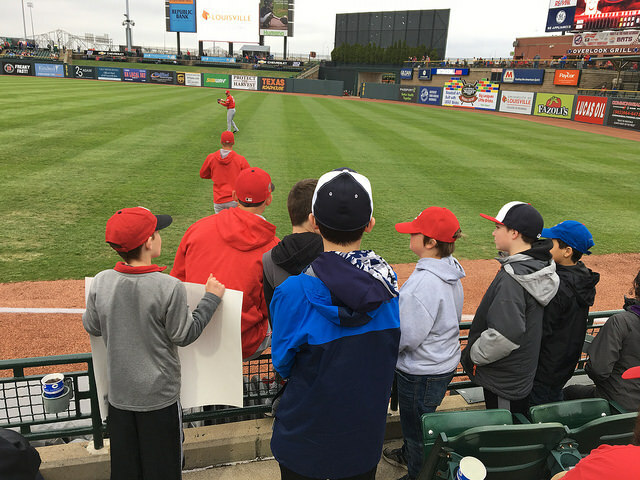 Louisville Slugger Field-Louisville, KY: We’re so glad that Bats baseball is slowly creeping back into our lives! 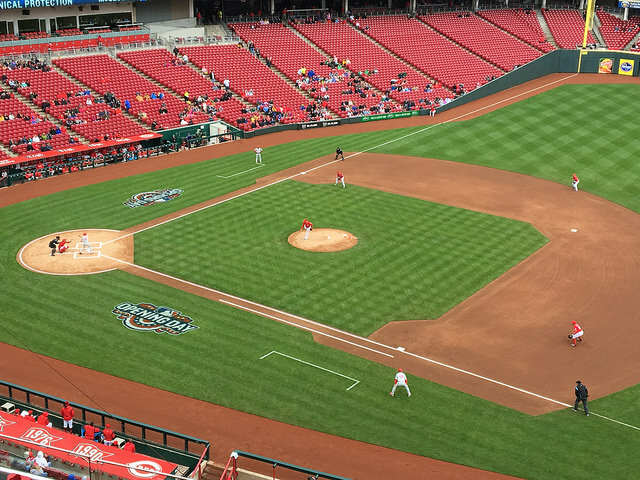 On Friday night the Bats (sort of) hosted the Cincinnati Reds for an exhibition game. 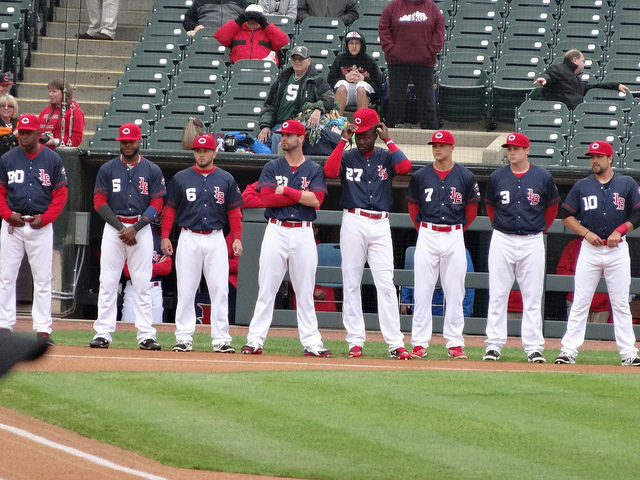 I say ‘sort of’ for the Bats because in all reality, this was a Red’s Futures team, which probably very few from this roster will be actually seeing time in Louisville this summer. Probably more guys from the Reds roster will be here, but it’s still baseball, and it was still a fun game. We got there as early as we could, to get our Adam Duvall bobble-head and our free Reds hats (we still cheered for our ‘Bats’, though). 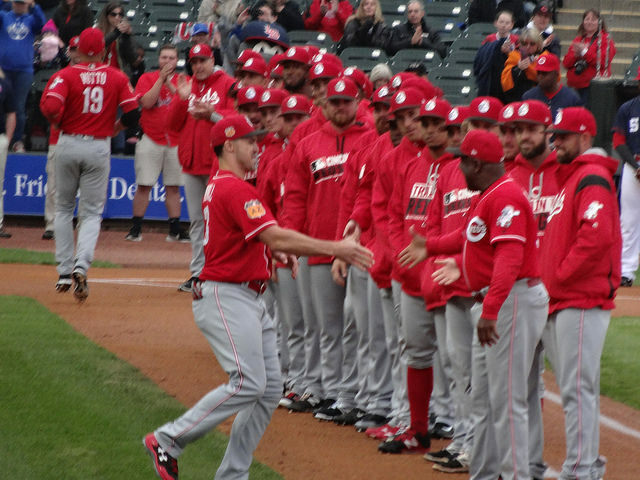 As the Reds were warming up, we noticed catcher Rob Brantly, who we saw play up in Michigan for the Whitecaps. Since they were old pals, Brian decided to go chat with him a bit. 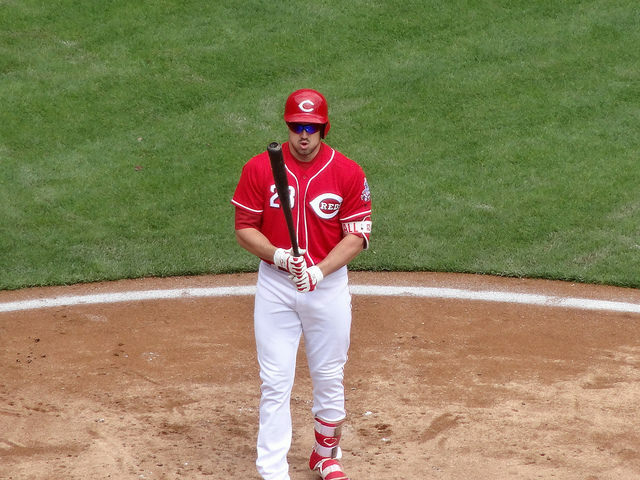 The obvious big pop for the night was for Louisville’s own Adam Duvall. He had a nice game, too, going 2-2 with a double. The game was low scoring, with both runs coming in the first two innings. 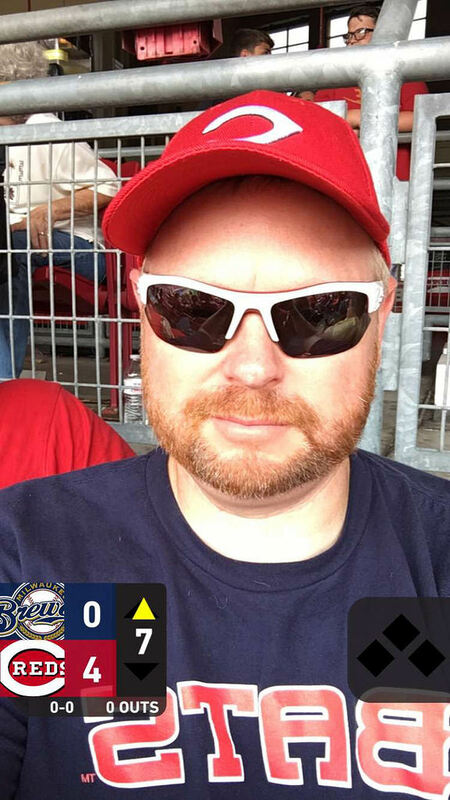 Rookie Davis started on the bump for the Reds. He pitched three innings, allowing one earned run and three hits with two walks, two strikeouts and a hit batsman. 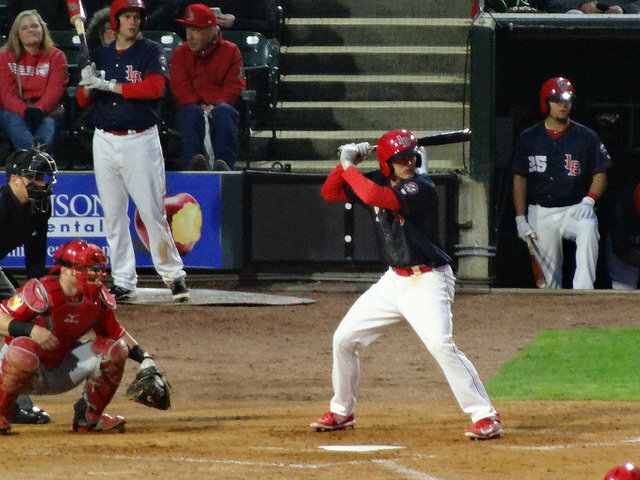 Tyler Mahle started for the Bats/Futures team, hurling five solid innings and allowing one run and seven hits with a walk and three strikeouts over 87 pitches. 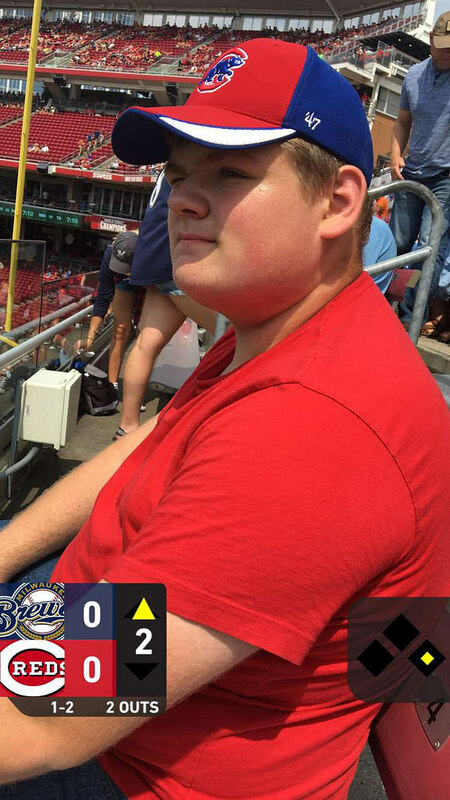 He gave up his only run in the first inning, when Billy Hamilton scored on a Joey Votto base-hit RBI. 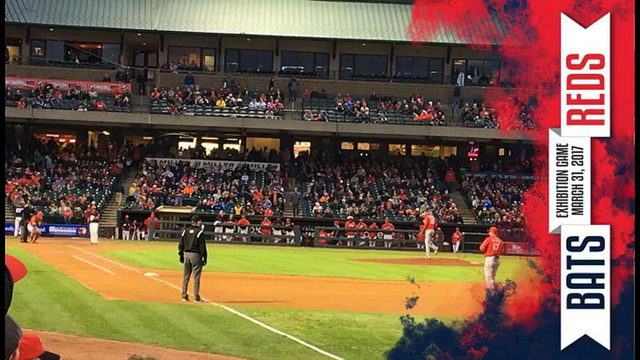 The Bats scored their lone run on a Aristides Aquino solo home run. Final: Bats 1, Reds 1. The game didn’t have a lot of action, but still a fun night with Brian. 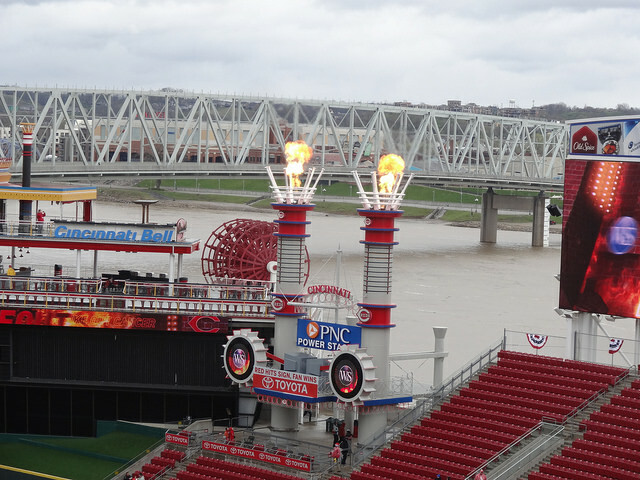 We have tickets for the Reds game on Thursday, but the weather calls for lots of rain, so I’m doubting we’ll get that game in. The Bats also start this week (officially), so we’ll still try to get a game in somewhere, somehow. I’ll leave off with a pic of Brian and Buddy Bat, who we were both glad to see for the first time in 2017!